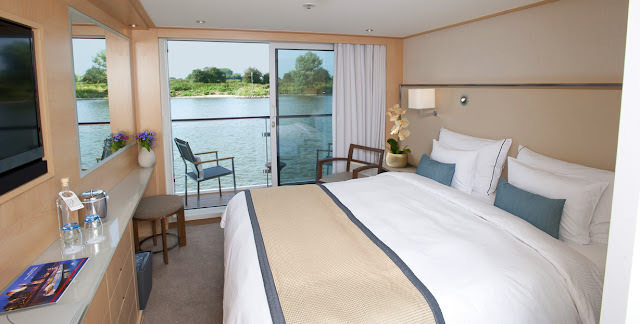 When a friend first suggested a river cruise to celebrate our respective retirements I never thought a year later I’d actually be on board the Viking Embla floating down the Danube. It did not disappoint; in fact, it far exceeded my expectations. We flew into Budapest, Hungary, which straddles the Danube River. After hours of flying it was a relief to see the Viking River Cruises representatives who ushered us to our hotel. An hour later we were taken on a short walking tour of the Castle Hill neighborhood to stretch our legs. I noticed a small grocery store, where I returned later to forage for dinner. Found cheeses, rolls, yogurt and something from the dairy case that turned out to be sweetened quark cheese enrobed in chocolate. It was the perfect dinner in our hotel room as we were too exhausted for anything else. Budapest is enchanting. The river splits the city with the Buda side being the hilly home to many residents. Views from here are lovely. The Pest side (pronounced “pesht”) holds downtown and is flat. Nestled into Buda’s hills is the Castle Hill district. 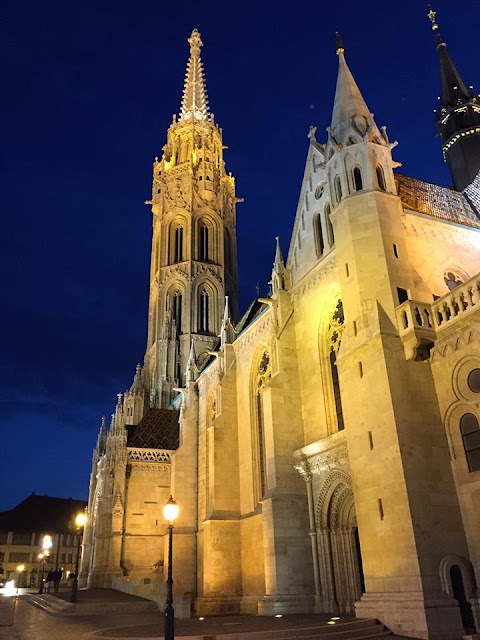 Visit the Royal Palace, an elegant reminder of the Austro-Hungarian Empire, ride the Funicular with its panoramic views, and experience the Rock Hospital dug into caves in the hill and used during the Battle of Budapest in 1945. Usually when I travel the first church I visit on a trip is my favorite. In this case it was the spectacularly beautiful Mattias Church but I have no doubt it would have been my favorite even if it hadn’t been first. During the day tour this Roman Catholic church but stop by at night to see it in its glory when brilliantly lit. On the Pest side of the river in the Jewish Quarter is the Dohany Street Synagogue, Europe’s largest. 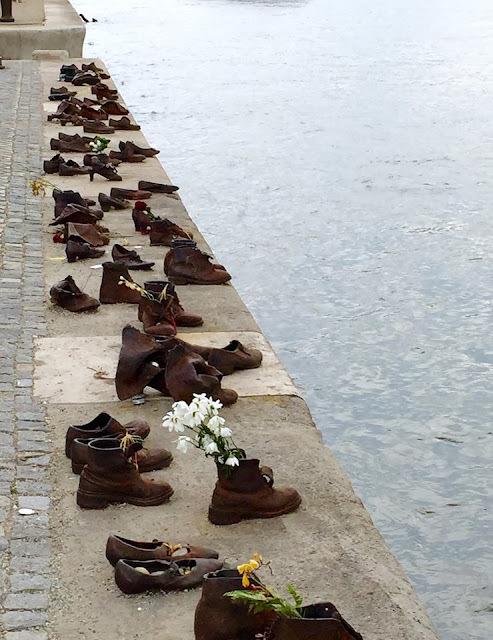 Perhaps the most moving remembrance for the city’s holocaust victims is along the Danube. The Shoe Memorial was created in 2005 to honor Jews who were killed in the waning days of WWII by fascist Arrow Cross militiamen. Members rounded up Jewish residents who were killed and thrown into the river where waters were described as running red with blood. Because shoes were valuable back in 1944 they were removed before victims were slaughtered. This amazingly simple and powerful memorial uses sculptures of shoes to stand in silent testament to the horrors that happened there. Just steps away is the third largest parliament building in the world. 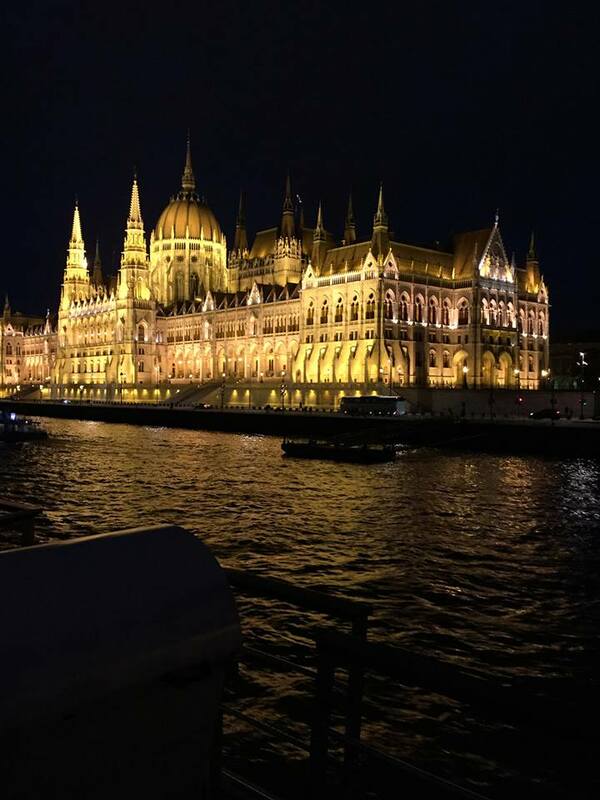 Finished in 1902 it houses Hungary’s Crown Jewels. As with the Mattias Church, you must see this building at night to marvel at it all lit up as if the good Disney folks had been involved in staging it. Breathtaking! Considering all this, it was no accident that our Viking cruise began after dark. Passengers made good use of their cameras as we quietly slipped under the chain of bridges along the Danube. Taking final looks at the church and Parliament Building, we headed out of Budapest and into our shipboard experience. The sun rose in Kalocsa, Hungary (pronounced like Iraqi city “Fallujah”). At an admittedly touristy show we watched Hungarian horsemen gallantly ride their well-trained steeds - so obedient they didn’t flinch as whips cracked like bullets in front of their eyes. I could only marvel. We picked up packets of paprika for souvenirs because it’s what you bring back from Hungary. Paprika is used in soups, stews, eggs, sausage, everything. Need a reason to cook with it? Paprika is chock full of vitamin C.
Whisked silently away along the Danube we then found ourselves docked on a Danube tributary in Vukovar, Croatia. (Vuka is the river that flows into the Danube and var means fortress). Using free time I walked into downtown Vukovar on a mission. My travel companion was running low on Tums and my Chapstick was buried somewhere in my luggage. I’d been directed to a pharmacy, which looked like the ones I know. Bright and clean, its shelves were stocked with the usual cosmetics, household items and candy, but no medications. I got my lip gloss there and headed down the street where I’d been directed to a drug store. They take the name literally. Only drugs, and only behind the counter. The sales clerk was patient and showed me three boxes of “anti-acids” but my Hungarian (ha) and her English kept me from understanding their differences. I went with the red box and luckily, Barbara reported it worked well. A small, but fun, adventure on my own in Croatia. Vukovar shows stark battle scars from fierce fighting in 1991 when Yugoslavia broke apart and the region was engulfed in war. Destroyed homes need rebuilding and bullet holes are visible around downtown. Fortunately, locals are positive, believing the fighting is over and the borders will hold. The biggest problem now is revving up flagging economies. An hour drive from Vukovar is Osijek (pronounced oh-zik), Croatia. We visited a family who treated us to homemade elderberry juice (which I found too sweet) and cake. Our host was 12 during the war and well trained to head for shelter when air raid sirens sounded. Now he grows poppies for his grandmother who won’t use store bought seeds because she complains they have an off-taste after being stored in plastic bags. Many treats in Eastern Europe feature poppy seed fillings and are delicious, though I doubt I could tell the difference between store bought and home grown poppy seeds. After our overnight ride the Viking Embla arrived in Belgrade, Serbia at 5 a.m. just as the sun was coming up. We slipped quietly into the dock but across the river were half a dozen discotheques on barges with the best speaker systems money can buy. The unmistakable boom boom boom of music wafted our way. Around 6 a.m. things shut down and weary partiers made their way up a steep flight of stairs to the street. Many were couples but some took the long sad journey solo. After a night of frenetic disco dancing they went home alone. In Belgrade we visited a church that is under construction – not re-construction as most of the older churches we visited were. Once completed – and no one knows when – it will be one of the largest Greek Orthodox churches in Europe. We marveled at its size and also that congregants stand during services, even long ones that can last three hours. The Kalemegdan Fortress in Belgrade, high above the city, embodies the history of this region with conqueror after conqueror taking control then losing to the next. In this case at least 115 battles were fought here. This region is beautiful but in a terrible location at the crossroads of Europe, the Mediterranean and Asia - just right for marauding armies to regularly sweep through. Happily, all seems peaceful and it appears current borders may hold for a while. Just in time, as trip exhaustion was setting in, we had a lazy day aboard our ship to float through the spectacular Iron Gate Gorge. In this narrow stretch the Danube cut four dramatic canyons that brought gasps and elicited an untold number of photos. With batteries recharged we next found ourselves in Vidin, Bulgaria. Some took a tour of the Belogradchik Fortress and Rocks, with each formation bearing a name and story to go with it. They saw and heard about “The Schoolgirl,” “The Shepherd Boy,” and “The Madonna.” But I opted for a cooking demonstration in a Bulgarian home. A local woman named Ramona welcomed us and demonstrated the making of Banitsa, a popular feta cheese pastry. Then the 10 of us who were gathered around her kitchen made another batch and to our delight it turned out well. Back home now, I am still experimenting with the recipe and getting closer to getting it right with each successive attempt. The following day we took a one-and-a-half-hour bus ride from the river to the charming, hilly town of Veliko Tarnovo, Bulgaria. A downtown street was blocked off to create a pedestrian way lined with small shops perfect for souvenir hunting. 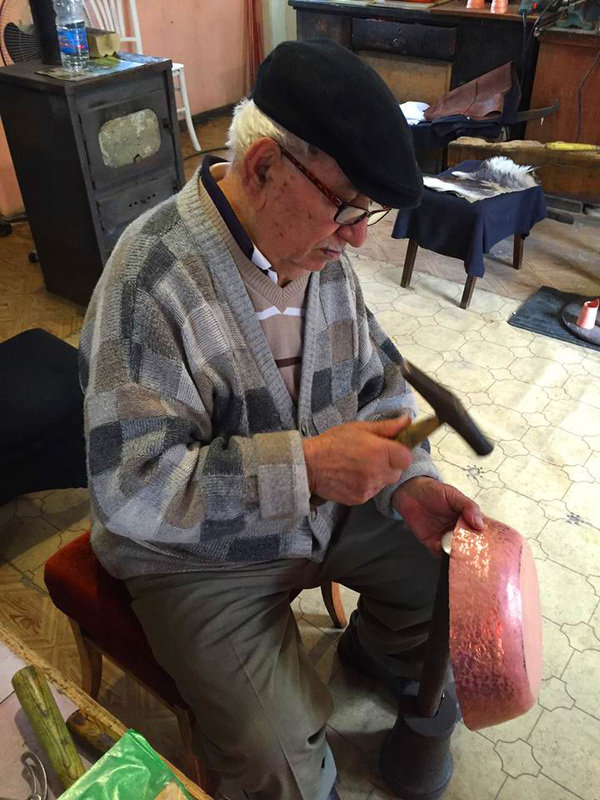 Look for the coppersmith at work, handmade earrings and items made from roses, which adorn home gardens and public spaces everywhere. I bought tubes of rose scented hand cream to the delight of my female friends. Bucharest, Romania is about two hours from the Danube and was our final stop. Driving into the city we went through one of the saddest looking slums I’ve ever seen but the rest of the urban area seemed energized. We were told that while the economy remains sluggish in Romania, in Bucharest unemployment has dropped to just two percent. The city is a mix of old buildings interspersed with showy government structures built by hated Communist dictator Nicolae Ceaușescu in the 1980s. He starved Romanians by exporting most of the country’s harvest and keeping the standard of living low to pay for his excesses. The grand boulevard he built in the heart of Bucharest is reminiscent of Paris’ Champs-Elysees but a few feet wider to show that Ceausescu ruled over a world-class city. It was disturbing seeing such displays of greed and narcissism knowing how Romanians suffered. But they seem to go about their lives looking more forward than back. Being onboard the Viking Embla was delightful. Staff existed solely to please. We wanted for nothing. Food on a grand scale day in and day out and everything handled with clockwork precision. Time for a bus tour? Buses are lined up and ready for boarding. Supposed to return at 12:30 p.m.? Count on it. Rooms are small but big enough. Ours was 205 square feet according to Viking's website and included a balcony with two chairs just above water level so we enjoyed sitting and watching the world go by. The small luxury of paying a higher fare for this type of cabin, a Veranda Stateroom, was worth it. Sitting outside during the cruise was an especially nice treat. As I began to contemplate re-entry into the real world beginning at the airport in the morning, I found a scale in the hotel bathroom. It was a no-brainer to avoid, figuring a few more hours of not knowing the truth wouldn’t hurt. This was a fascinating vacation with the complete package of new foods, history I knew little of, and just the right amount of shipboard pampering. Frances Howell is a retired journalist who spent 41 years in radio news, media relations and nonprofit management but now enjoys traveling, cooking and volunteering at the local food bank.